Contamination of biotherapeutics, water, and other laboratory constituents is a major concern for labs, pharmaceutical & biotechnology industries, and water purification centers. Hence, virus filtration products are widely employed by different industries to maintain an environment free from pathogens such as viruses, bacteria, and microbes, and develop products with high grade of safety and safeguard health. Increase in the number of biopharmaceutical and biotechnology industries across the globe has fueled the growth of the global virus filtration market. Additionally, rise in investments in R&D by private and government establishments is expected to boost the growth of the market during the forecast period. However, stringent regulations associated with the validation of virus filtration products is anticipated to hamper the growth of the global virus filtration market. Based on product type, the global virus filtration market has been categorized into virus filters & filtration systems, kits & reagents, and services. The kits & reagents segment is projected to expand at the highest CAGR during the forecast period due to recurring use of these products in various laboratory techniques, R&D projects, and biopharmaceutical industries. In terms of revenue, the kits & reagents segment is anticipated to dominate the global virus filtration market from 2018 to 2026. In terms of application, the global virus filtration market has been classified into biological, medical devices, water purification, and air purification. The biological segment can be divided into vaccines & therapeutics, blood & blood products, stem cell products, and others. Rise in adoption of biotherapeutics owing to lower adverse effects is expected to propel the biological segment during the forecast period. The biological segment is likely to dominate the market in terms of revenue from 2018 to 2026. Based on end-user, the global virus filtration market has been categorized into pharmaceutical & biotechnology companies, contract research organizations, medical device companies, and others. In terms of revenue, the pharmaceutical & biotechnology companies segment dominated the market in 2017, owing to presence of large number of these companies and rise in adoption of biotherapeutics among the population. The segment is expected to expand at the highest CAGR of 14.2% during the forecast period. In terms of region, the global virus filtration market has been segmented into North America, Europe, Asia Pacific, Latin America, and Middle East & Africa. 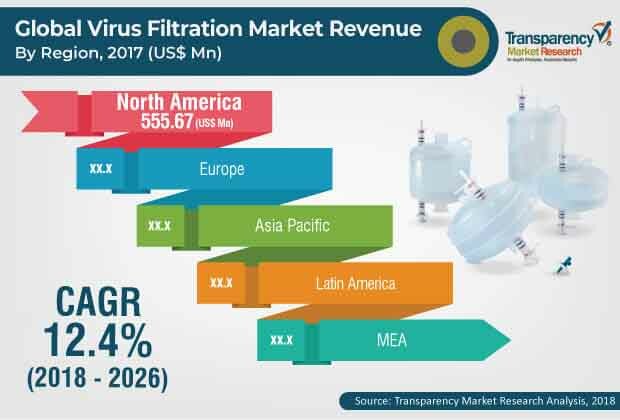 Presence of key players and increase in demand for virus filtration products boost the growth of the market in North America. Technological advancements, rise in adoption of biopharmaceuticals, increase in investments in R&D projects by major players is projected to propel the virus filtration market in Europe. Presence of favorable government regulations, increase in population, cheap labor, and growth of the industrial sector are the major factors driving the market in Asia Pacific. The market in Latin America is driven by rapid adoption of new technologies, increase R&D projects, and rise in the number of players. Additionally, surge in awareness about the usefulness of biotherapeutics is expected to augment the market in Latin America during the forecast period. Major players operating in the global virus filtration market include Merck KGaA, Asahi Kasei Corporation, Sartorius AG, General Electric, Thermo Fisher Scientific, Inc., Danaher, PendoTECH, Lonza, Charles River Laboratories, and Medical Respiratory Devices. This report analyzes the current and future scenario of the global virus filtration market. Rise in awareness about biotherapeutics has fuelled the growth of the biopharmaceutical industry in the past few years. Moreover, increase in investments in R&D by public and private sectors contributed to the growth to the global virus filtration market. Favorable regulations by government bodies have also been pivotal in the establishment of various biotechnology and biopharmaceutical industries. Demand for better and safer pharmaceutical products without the presence of any microbial contaminants have contributed to the demand for virus filtration products. These factors are projected to augment the global virus filtration market during the forecast period. The global virus filtration market report comprises an elaborate executive summary, which includes information about various segments of the market. It also provides information and data analysis of the global market with respect to the segments based on product type, application end-user, and region. A detailed qualitative analysis of drivers and restraints of the market and opportunities has been provided in the overview section. Additionally, the section comprises competitive matrix and company profiles along with business overview to understand the competitive landscape in the market. This section of the report also provides market attractiveness analysis by region and market share analysis by key players, thereby presenting a thorough analysis of the overall competitive scenario in the global virus filtration market. Based on product type, the global virus filtration market has been classified into virus filters & filtration systems, kits & reagents, and services. Kits & reagents are the most commonly used products for the removal of viruses and other microbes. These products are widely utilized across different industries, research centers, and academic institutes. In terms of application, the global market has been categorized into biological, medical devices, water purification, and air purification. Based on end-user, the global virus filtration market has been divided into pharmaceutical & biotechnology companies, contract research organizations, medical device companies, and others. The market size and forecast for each of these segments have been provided for the period from 2016 to 2026, along with respective CAGRs for the forecast period from 2018 to 2026, considering 2017 as the base year. In terms of region, the global virus filtration market has been segmented into North America (the U.S. and Canada), Europe (the U.K., Germany, France, Spain, Italy, and Rest of Europe), Asia Pacific (India, China, Japan, Australia & New Zealand, and Rest of Asia Pacific), Latin America (Brazil, Mexico, and Rest of Latin America), and Middle East & Africa (South Africa, GCC Countries, Israel, and Rest of Middle East & Africa). The market size and forecast for each of these regions and the mentioned countries/sub-regions have been provided for the period from 2016 to 2026, along with respective CAGRs for the forecast period from 2018 to 2026, considering 2017 as the base year. The research study also covers the competitive scenario in these regions. The report also profiles major players in the global virus filtration market based on various attributes such as company overview, financial overview, product portfolio, business strategies, and recent developments. These players include Merck KGaA, Asahi Kasei Corporation, Sartorius AG, General Electric, Thermo Fisher Scientific, Inc., Danaher, PendoTECH, Lonza, Charles River Laboratories, and Medical Respiratory Devices.